Knowing basic hand sewing techniques allows you to quickly make repairs and do small projects. Even if you have a sewing machine, there are times that hand sewing is better to give you the results you want. Learn about hand sewed stitches, how to sew them, and which technique works best for different purposes. Threading a sewing needle can be an exasperating task. There are tips and tricks that can help make it less frustrating. For example, place a white background behind the needle to make it easier to see the eye and thread. Cut the thread with sharp scissors (to prevent frayed ends) at a 45-degree angle. Be sure to stiffen the thread using water, saliva, or wax. If you still have difficulty, use a needle threader tool or tweezers. Place the handle of the threader in your dominant hand, holding it between your thumb and forefinger. Pass the thread through the diamond-shaped wire (which is a much bigger target than the eye of the needle). Keep hold of the thread in one hand. Draw the needle away from the threader handle and back up the wire. The thread will pass through the eye of your needle and now the needle is threaded. Hand sewing needles are available in all kinds of shapes and forms. With most needles, the larger the size number, the smaller the needle. Finer needles are used with thin or delicate fabrics while heavier needles are used with thick fabric. Place the end of the thread on your pointer finger, holding it in place with your thumb. Wrap the thread around your pointer finger a couple of times. Using your thumb, slide the thread loops towards the end of your pointer finger. The loops will wrap around each other as they travel toward the end of your pointer finger. Slide the loose knot to the end of the tread, then tug on the thread to tighten the knot. Insert the needle into the fabric where you want to start the seam. Bring the needle back through both layers of fabric a short distance in front of the previous stitch. Insert the needle back into the fabric in the middle of the first stitch. Bring the needle up through the fabric the same distance you came forward in creating the first stitch. Continue, making a continuous line of back stitches. Basting stitches are long, removable running stitches often used to join fabric temporarily. sewn to temporarily sew fabric together. You often use this stitch in preparation of machine sewing a final seam. You usually do not baste exactly where you will machine stitch, as you want to be able to easily pull out the basting once you are done. Thread a hand sewing needle and knot the thread. Stitch through the fabric to the back side, skip a small distance, and stitch back up to the right side. Repeat the stitch in a straight line for the distance needed. Sew one or two stitches in place at the end of the area you want to be basted. Thread your needle and knot the end of the thread. Anchor the knot on the inside of the garment or a hidden location. Pick up a few threads of the fabric directly under where the knot is anchored. Pull the needle through the fabric toward the hem edge. Move the needle over and insert the needle into the hem edge, so the stitch itself is under the hem edge. Repeat the stitch and continue until finished. Stich up from the back side of the fabric to the front side. Insert the needle into the top side of the fabric in the same spot, keeping a loop of thread on the top side. Bring the needle back up through the right side of the fabric a short distance from where the needle went into the fabric. Insert the needle through the loop of thread on the front side of the fabric. Pull the needle through the fabric, anchoring the loop. Be sure you don't pull the thread too tight so you maintain the loop shape. Repeat to make a chain of stitches. A blanket stitch can do more than trim a blanket. You can use it to decorate the edges of many sewing projects. Often, you will use a contrasting thread color or a thicker thread or yarn. You can play with the spacing and length of the stitches for different looks. A shank button requires being hand sewn. Some sewing machines can sew on a flat button, but it is often quicker to use hand sewing. Use button or carpet thread as these are stronger. To sew on a shank button, you will make several anchoring stitches without the button, then sew six or more stitches through the shank of the button. 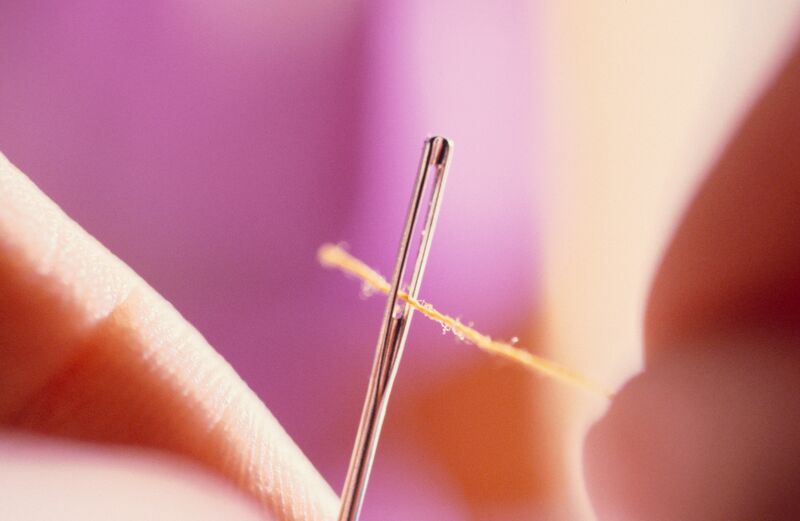 Use a toothpick or pin to help you keep the stitches loose enough so the shank doesn't poke through the fabric. For a flat button, start by sewing an X on the fabric where you want to place the button. Insert a pin or toothpick through the X. Sew up and down through the holes in the button several times. On the final pass, bring your needle and thread only up under the button. Wrap the thread tightly around the base of the button a few times. Pass the needle through this bundle a time or two. Then bring the needle back to the back side of the fabric. Stitch through the stitches to form a loop and make a knot. A fabric yo-yo is a gathered circle of fabric you can use to decorate many projects. If you are a beginner to hand sewing, this is an easy project that can help you develop your technique. Then you can go on to use yo-yos in various ways. Your Guide for Learning How to Sew Anything and End Up Loving Sewing! Don't Skip Stay Stitching and Know Direcional Stitching!